Kangaroos occupy a strange place in the Australian psyche. Whilst the creature is their national symbol, thousands of them are culled each year and whilst there is thriving kangaroo leather industry that sells accessories to tourists, the majority of the meat goes into pet food. 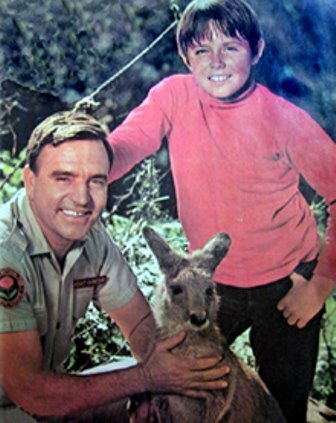 Aussies it seems are a little squeamish about eating skippy. To try and and get people to change this ridiculous bit of anthropomorphic idiocy the Kangaroo Industry Association of Australia ran a competition to rename the meat last year (and yes skippy did come up). Whilst the change was never intended to be actioned it was a good bit of PR which highlighted the fact that Australia is missing out. 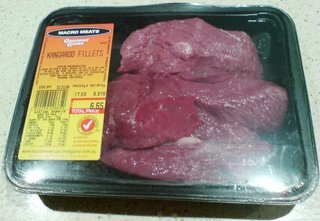 Kangaroo meat, as you can see from the picture at the top, is about the same colour as venison and is very similar in taste. 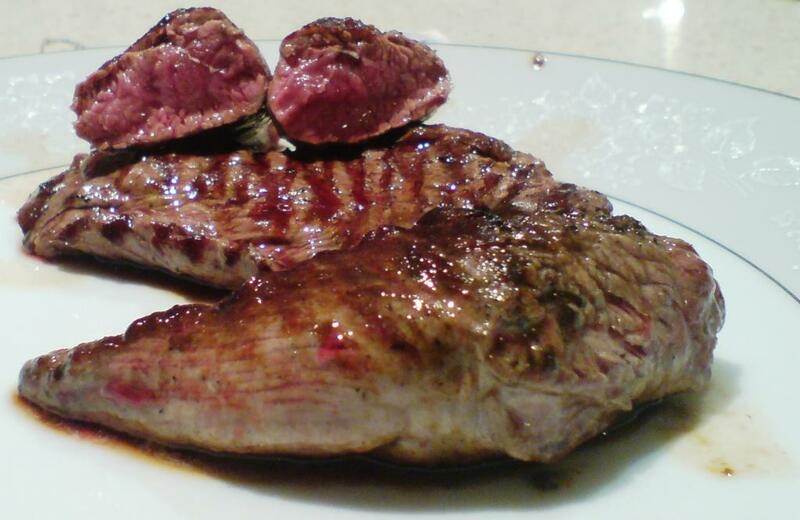 However it is much more tender and much more easily cooked, it is also exceptionally lean there is almost no fat. The meat chars to an almost caramelised outer shell when cooked on a very high heat. In the picture below I've not done much more than sear it on each side on a griddle pan. It is best eaten as rare as you can take it and benefits from about 10 minutes resting time after cooking. It has a slightly gamey flavour that goes beautifully with mushrooms, garlic, thyme and other strong flavours. As befits its' nation of origin it barbeques beautifully! Australia really needs to get over itself and take another look at Kangaroo. Oz has the world's second highest obesity problem per capita (after guess where). You would have thought that a low fat meat that barbeques better than any other that I've tried would be perfect. We went to Tasmania for a long weekend a few weeks ago. It is a land of beer, wine, peculiar wildlife and many cheeses, some so virulent that they set off the explosive detectors at the airport. At least that's my story, the reason that I got checked for explosives probably had more to do with my general demeanour. I'm not comfortable with flying at the best of times but having raced to fill the rental car with petrol before returning it and finding that the chip in the widscreen was going to cost us the nearly as much as the rental again put me in a bit of a tiz. Then running to the terminal to be told that we had run to the wrong terminal didn't improve my mood hugely. The most annoying thing about air travel at the moment is that if you don't maintain a kind of detatched calm throughout the entire process, no matter what logistical or bureaucratic obstacles are put in your way, then you are guaranteed to be stopped at some point and either searched or explosives checked. Never attempt anything without first having a good strong cup of coffee and a decent breakfast, ever. Sadly the Tasmania trip was before the Canberra one and I didn't have the benefit of the insights above. On being explosives checked I fixed the customs officer with a cheeky grin and said "it's the bloody cheese isn't it?" in my best posh english accent. When he reached for the bag I inadvertently spluttered out "careful man, there's a culture in there, you don't want one of those here". Whilst I was definitely misunderstood I don't think this one me many friends. However I made plenty more new friends shortly afterwards when Emily left me behind, blithely waved both boarding passes at the ground crew and set off accross the asphalt, still holding both boarding passes. I made lots of new friends then. I think I may have reached my boredom threshold. Having battled with my commitment and motivation level at work I am actually having to make the admission to myself that I am really very bored indeed. Not the 'not busy' kind of bored but the kind of bored where you look at your life and think 'what the hell am I doing?' For example I woke up at 5:30am today , worried about the amount I have to do today and it's all easily acheivable but I just don't want to do it, not a moment of it. Things have been this way for some time and it is something I need to address. I am now looking at ways to improve this in my current role before I start looking for anything else or changing direction. If you aren't going to try you shouldn't have got in to it in the first pace. I am going to start using some of the elements from a strategy meeting last week and some of my own thoughts on methods I might use to sort myself out. I'm going to start looking at new products and where we might sell them and to whom. I'm going to be looking at how I can improve the general dynamism of the company and what we do about the way we spend money on chasing things that look good but we can't do. I've also got to try and get away from one of our projects as it is quite clearly a dog with fleas, big fleas (unfortunately it is also the MD's pet). ...more later, just what's on my mind this morning.